Amphibian oocytes and embryos are classical models to study cellular and developmental processes. For these studies, it is often advantageous to visualize protein organization. However, the large size and yolk distribution make imaging of deep structures in amphibian zygotes challenging. 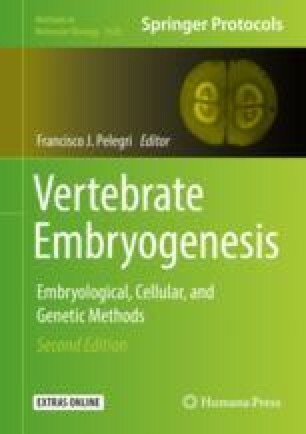 Here we describe in detail immunofluorescence (IF) protocols for imaging microtubule assemblies in early amphibian development. We developed these protocols to elucidate how the cell division machinery adapts to drastic changes in embryonic cell sizes. We describe how to image mitotic spindles, microtubule asters, chromosomes, and nuclei in whole-mount embryos, even when they are hundreds of micrometers removed from the embryo’s surface. Though the described methods were optimized for microtubule assemblies, they have also proven useful for the visualization of other proteins. The online version of this chapter ( https://doi.org/10.1007/978-1-4939-9009-2_2) contains supplementary material, which is available to authorized users. We thank Sean Megason, Angela DePace, Evangelos Gatzogiannis, Mike Levine, and Laurence Lemaire for usage of their microscopes. Thanks to members of the Wühr Lab for comments on the manuscript. This work was supported by grants GM39565 and 1R35GM128813 from the National Institutes of Health and Princeton University startup funding.